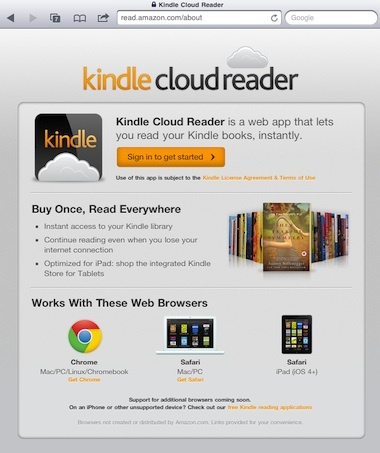 There is a lot of press around the new ‘Cloud’ version of the Kindle eBook reader from Amazon… and there is good reason. Normally when you think of ‘online’ versions of eBooks, you are basically getting a HTML Web version of a book. There are a lot of folks attempting to get the experience right, usually endless scrolling pages or creative navigation. Being a Web site means that as long as your online, you have your eBook. In the case of Amazon, to comply with Apple’s rules, the ability to purchase eBooks through the Free Kindle app was removed. Just in time for the introduction of read.amazon.com . The site seems to work particularly well for iPads, but Blackberry Tablet and Mac Desktop users are equally reporting successes. Through the URL, you have access to all of the eBooks you have on your Kindle acct. You may not expect though that you can download a copy of your eBooks to your iPad’s memory as a cached copy to read offline. Progress will be tracked the next time your iPad is online so the copies your reading in a Kindle reader will open to the right page. 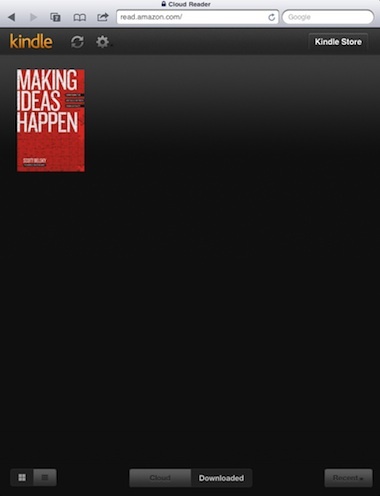 This is all done with HTML5 rather than eBooks as ePub. 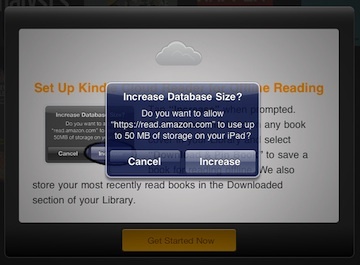 Since this view of your Kindle eBook purchases is not through a Apple regulated app, the read.amazon.com can allow you to make new eBook purchases. The library of books you already own can be viewed as online or downloaded. 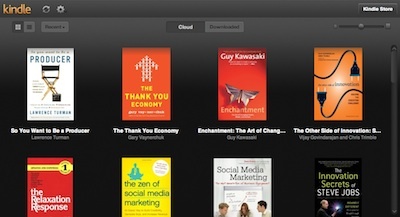 As the name implies, the ‘downloaded’ versions are copies saved to your iPad for offline reading. Tapping the center bottom buttons moves from the two library views. 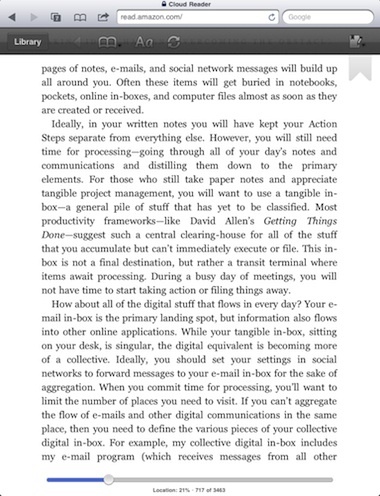 Notes and bookmarking pages within a book are even handled, through a icon in the upper corner. Options to quick jump and navigate through your eBooks are limited compared to the Kindle eBook app or reading eBooks via the Kindle device. The top four most used navigation options can be reached through the upper navigation bar. 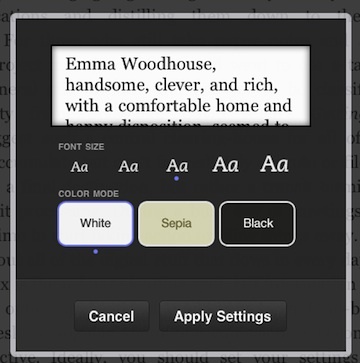 Font size and background colors are adjustable like you would expect in a reader app. 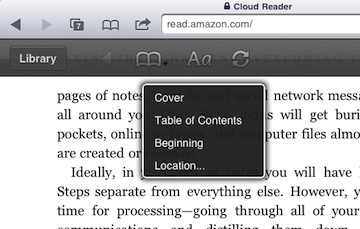 All devices that access the ‘online’ version of the eBooks are offered the option to allow the service to store more in the local memory than a Web site would normally. 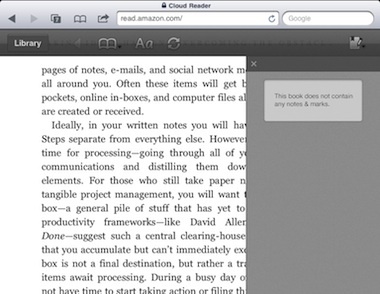 In this case, you need to allow if you wish to have your eBooks cached for offline reading. This is the desktop Web browser view of a user library. 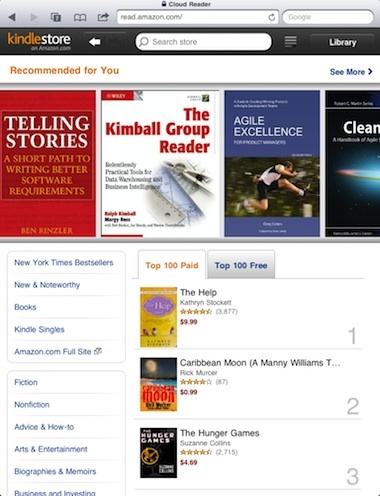 The read.amazon.com interface looks, works and feels the same across the many platforms we tested. For us in the software design business, very impressive.